I've been waiting a long, long while to get behind the wheel of a Porsche. I'm one of those secondhand fans that reads the reviews and goes to the races but has never actually done more than taken a few photos of the one GT3 RS 4.0 I saw parked at a show. I've been lucky enough to spend time behind the wheel of a great number of high-performance cars, but a Porsche has always been my Carrara White Metallic whale. After some back and forth, I was given the keys to a 2017 Porsche Macan GTS. My time had come. Likewise, until recently, driving in the snow was mostly a foreign concept to me. I learned to drive while living in the South before moving to Los Angeles after college. I understand the principles and precautions on paper, but I've never really had to deal with snow the way I do now that I've moved to Michigan. 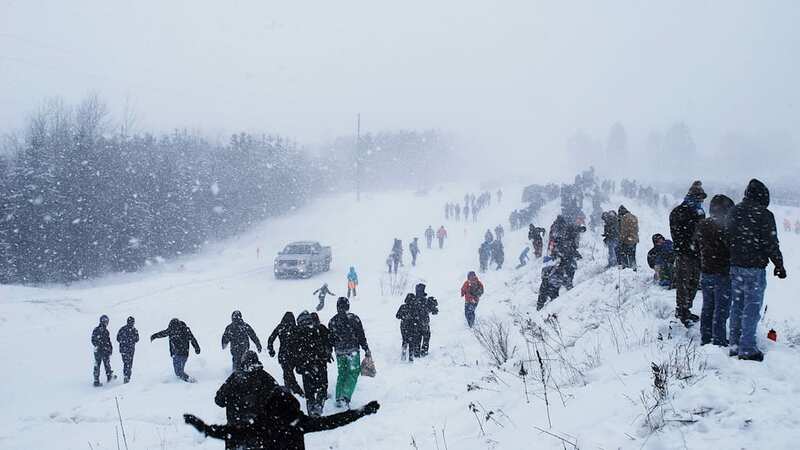 In the South, mass panic ensues if anyone catches a whiff of the white stuff, with store shelves quickly emptying of milk and bread in order to stave off what's sure to be a long, cold 12 hours or so. 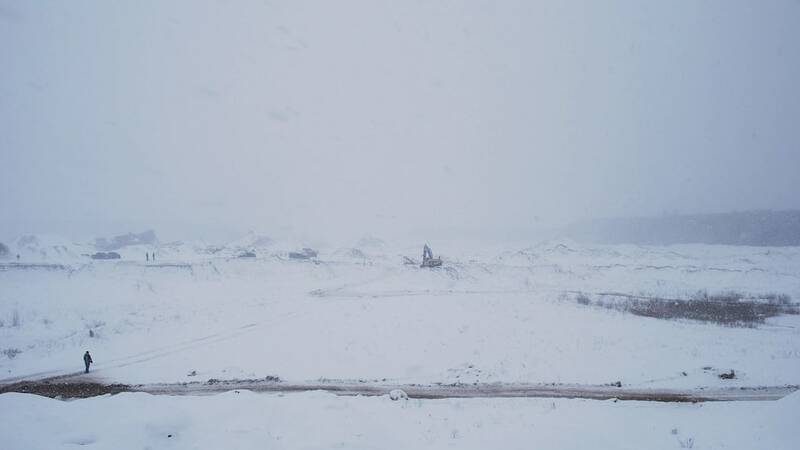 In Michigan, snow is just there, ever white and ever present. In the spirit of both racing and snow, I decided to go to Northern Michigan to watch Sno Drift, a semi-amatuer rally that takes place in late January. 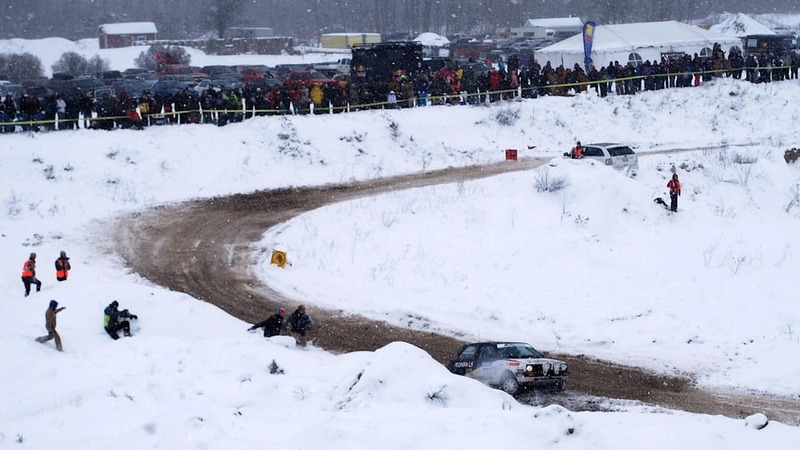 Rallys, especially amateur ones, are wonderful events to attend. 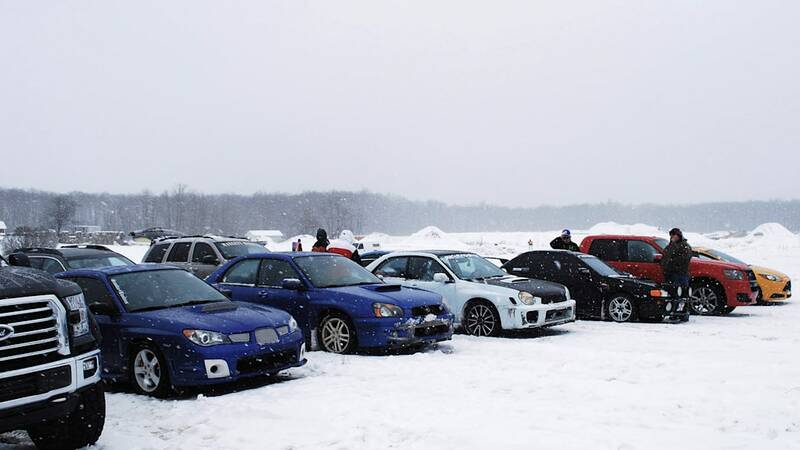 Aside from the requisite sea of Subarus, the 2017 Sno Drift lineup featured a few first- and second-gen Volkswagen Golfs, a Euro-spec Mitsubishi Mirage, and even an FC Mazda RX-7. Competition is friendly and cars are mostly piecemeal assemblages of the best of what was affordable. Many aren't far off what you'd find in Mad Max. I figured a Porsche might stand out a little. The Macan GTS is the middle child in the lineup. 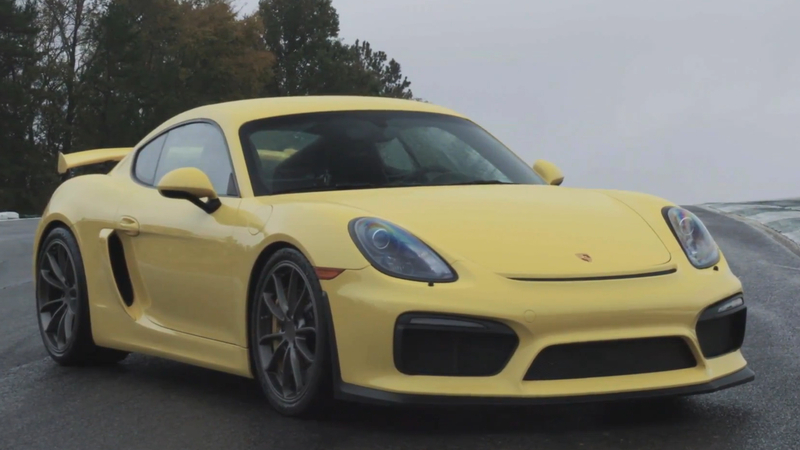 On other Porsches, the GTS model has been considered the sweet spot, the perfect balance of cost, options, and performance. The same seems to hold true here. All Macans have a twin-turbocharged V6, this one displacing 3.0 liters. The engine sends 360 horsepower and 369 pound-feet of torque through a seven-speed PDK transmission out to four black 20-spoke wheels. The staggered setup comes with 265/45R20 tires up front and massive 295/45R20s out back, perfect for driving in the snow. 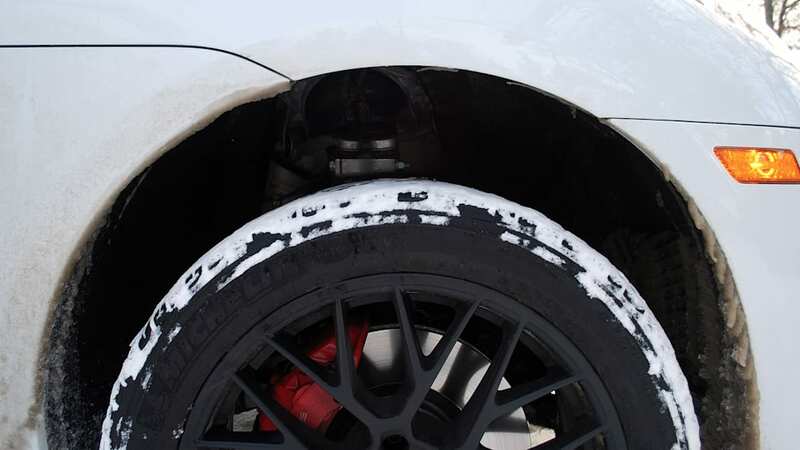 Or not, but at least it had been swapped to winter rubber. I somehow managed to convince my wife to join me on this endeavour. 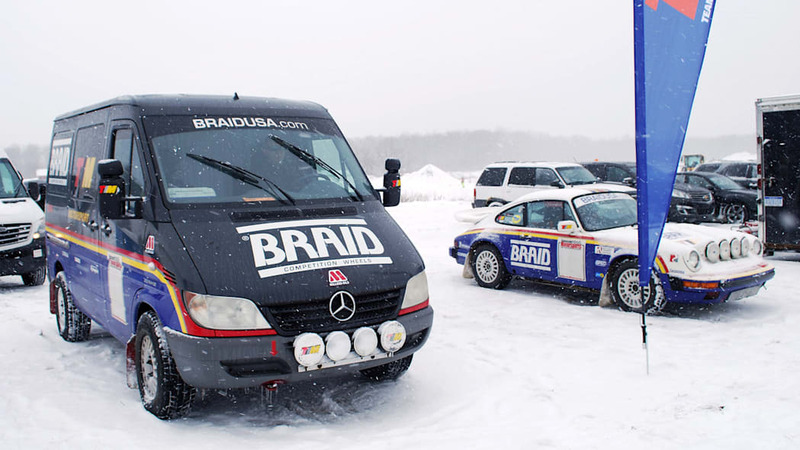 Two of her favorite things are motor racing and standing in a sub-freezing snow storm, so she was overjoyed for two days of it. Our Carrara White Metallic model was fairly bare bones, at least as far as Porsches go. This one had the optional GTS interior (separate from the GTS trim) that includes black Alcantara with Carmine red stitching and matching red seatbelts. Personally, I loved it. My wife wasn't as sold, but she's been known to be wrong before. We were staying at an Airbnb, and the evening we were set to leave I received a text from the host asking if I had all-wheel drive. 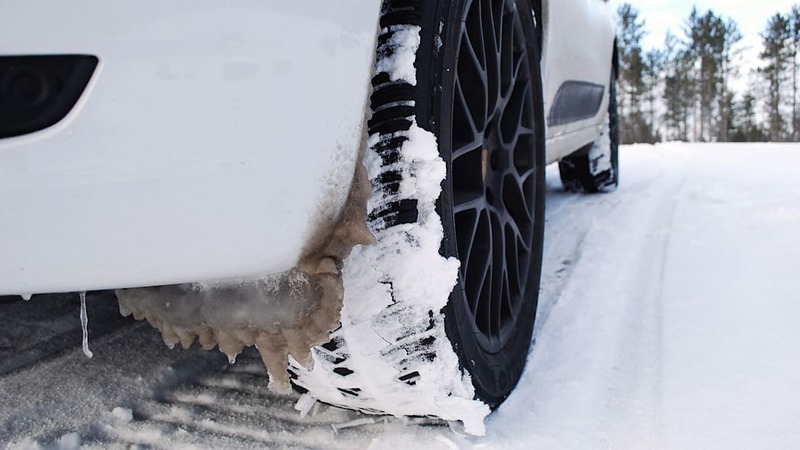 Yes, and excellent Michelin winter tires. The thought of driving the Macan on snow-covered streets was making me giddy. 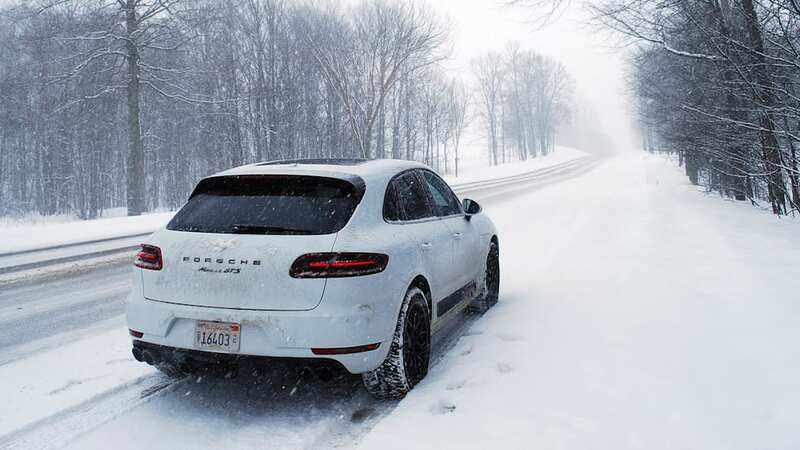 Because of the weather, the drive from Detroit to Flint took twice as long as it should have, though it did give me time to get familiar with the Macan's interior, infotainment, and settings. The Macan GTS has adjustable air suspension, adjustable drive modes, an off-road mode, and a fantastic little button that opens up the exhaust. Not all V6s sound good, but not all V6s are created equal. This engine, combined with PDK, is a sweetheart. Rev, pop. Rev, pop. Rev, pop. Each gear just snaps into place in milliseconds with a gentle pull of the shift paddle. Though the computer is likely more efficient than I am, if I'm driving an automatic then I'm going to use the paddles. The perfectly sized and perfectly comfortable and perfectly clean steering wheel helps matters, too. We arrived at our snow-covered cabin roughly four hours after we left. The roads weren't plowed and it was obvious there was no intention to do so. Perfect. The lanes were far wider than they needed to be with great visibility and next to no traffic. Obviously, there was plenty of fun to be had the next day, strictly for journalistic purposes. 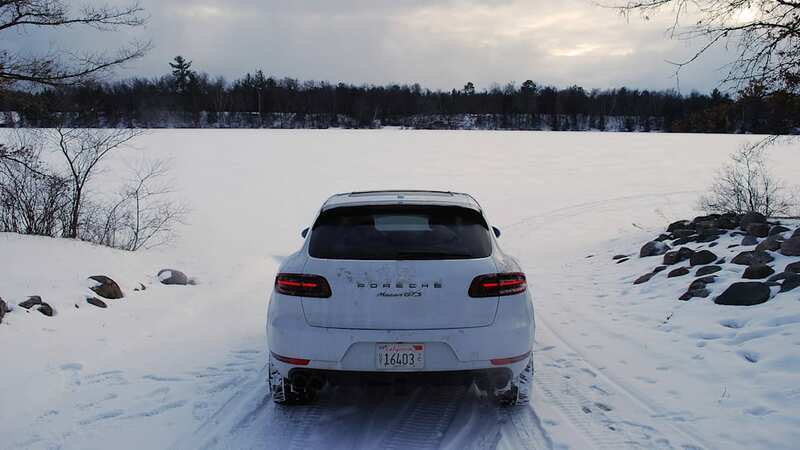 The next morning, after removing about two inches of overnight accumulation from the Macan, we set off for Sno Drift. The morning wind was heavy, but initially the snow seemed to hold off. That gave me a bit of time to play around. 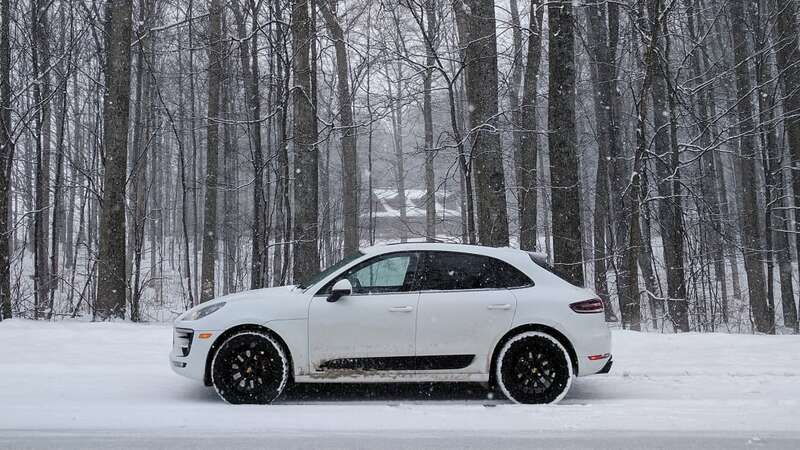 The Porsche Macan GTS, with those chunky Michelin tires and that magic all-wheel-drive system, was unstoppable in the snow. Every corner was taken with a touch of oversteer, powering through, waxing the wheel, and pointing the nose. There wasn't a single instance where I felt out of control. I would love to get one on some proper snow tracks. The Macan GTS just moves where you want it to. It may look like a crossover, but it sure as hell doesn't dance like one. The lowered air suspension and the car-like seating position betray its SUV roots. There's no top-heavy feeling, no exaggerated body roll, and no indication that it's any less capable than a performance hatchback or wagon. The steering, brakes, and accelerator all work in perfect tandem. 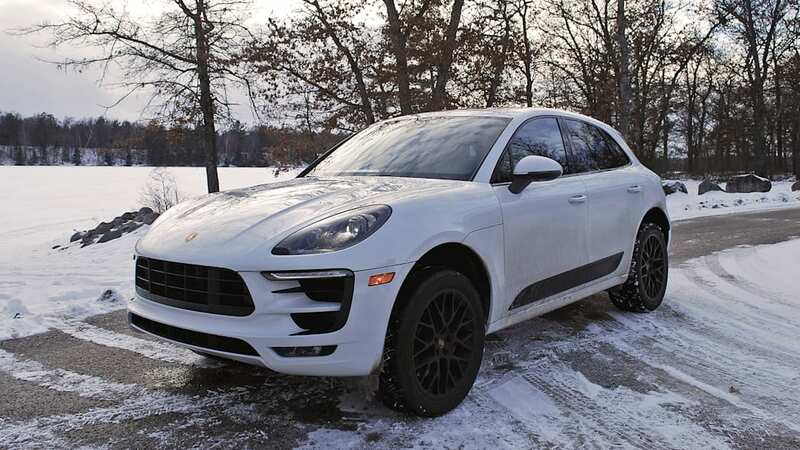 The only letdown was the occasional movement that reminds you that the Macan is still a bit of a 4,000-plus-pound porker. It's loads of fun, but it's not quite as nimble as a true hatch. After a bit of tomfoolery, I set off towards one of the main stages of the rally. A brief look at the time sheet showed a bugeyed Subaru WRX leading, with a Mitsubishi Mirage close behind. The rest of the field was quite a bit back, with various WRXs and STIs filling out the top 10. The snow started to fall on the drive, and only picked up by the time we parked at the stage. From the get go I knew the Macan was going to stand out. The parking attendant seemed surprised to see it. "Porsche?" he said. "I think it costs more to park a Porsche." I didn't even bother with the "it's not really mine" line that comes up oh so frequently. It's just easier to laugh at the terrible joke and move along. We had a bit of time before the cars were set to arrive, so I walked around and scouted some good spots to watch the field. The actual stage was down below, with the spectators standing on a bank. It gave us all a great, stadium-like view where you could see 75 percent of the track from one single spot. While the view was great, crawling through the brush and the snow to get to the vantage points wasn't so easy. 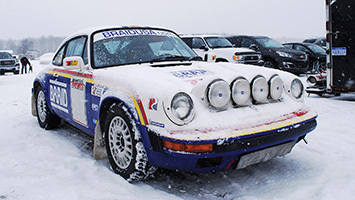 While I naively thought I would be the only Porsche in attendance, I managed to find the 1984 Porsche 911 Carrera "RX" owned by Team Illuminata Motorsport. Unfortunately, the car wasn't competing. It sure was pretty with the big lights, knobby tires, and lifted suspension. The car is mostly stock, and packs a 3.2-liter flat-six. The Mercedes Sprinter support van was the perfect companion. The setup was rather nice and far too clean and perfect for Sno Drift. Though the snow kept coming, the cars didn't. It was going to be another 45 minutes before they hit this particular stage, so I went back to the Macan to get out of the cold. Sitting inside with the engine off, I could hear a few people walking by and making comments. "Look at those tires! They're 295s!" or a dude in dreadlocks saying he "wouldn't want to screw up such a nice car out here." I think he underestimates the Porsche's capabilities. My wife said the Macan, in this setting, gets as much attention as a Dodge Viper at a small cars and coffee event. I couldn't disagree. A few minutes before the first car was due, we stumbled out of our warm, Porsche-shaped cocoon to find a good vantage point. The wind and the snow were really coming, though visibility to the stage was still fairly clear. What wasn't clear was the track. 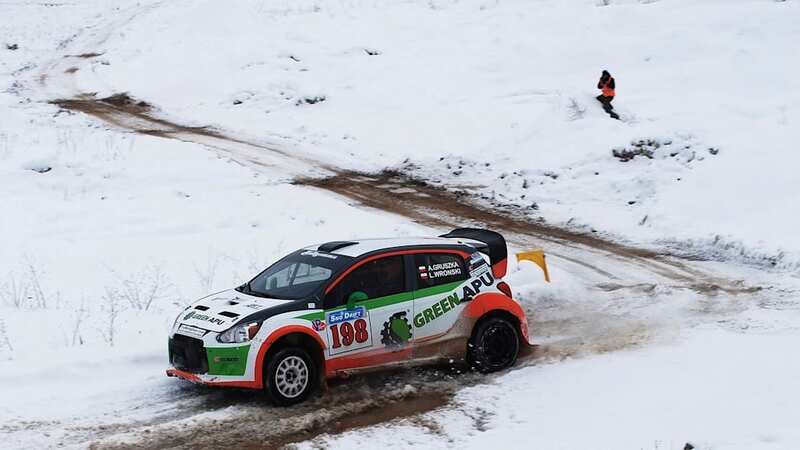 The lead Subaru overshot the first corner before hitting a snowbank coming out of the third, destroying any hope of winning the rally. It took 10 minutes and two shovels to dig the car out. The second-place Mitsubishi, having enough of a buffer to third, was relatively patient. Only on the straights could you really hear the engine crack as the driver shifted the sequential Quaife transmission. The rest of the pack was a mix of caution and zeal. Each car dug the track deeper, mixing gravel, snow, and mud into a filth that's sure to permanently reside inside some of these cars. A few got stuck, a few spun, and the final car, a second-gen Volkswagen Golf, made an impressive 180 up onto a snowbank. Though it was against the rules, members of the crowd ran down to help pull it out. 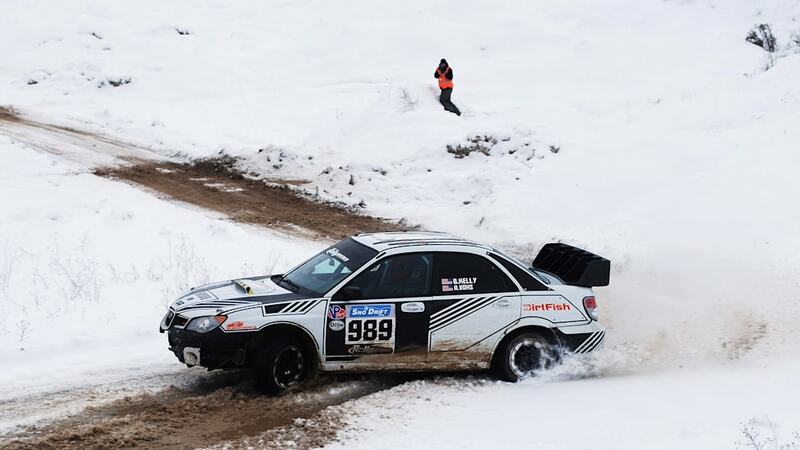 Amateur rallies are the best. 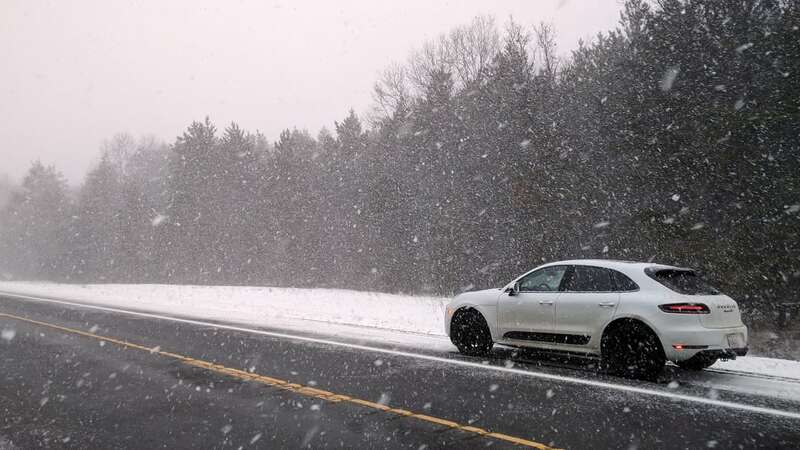 By the time the last car cleared out, the snow was falling harder than ever. 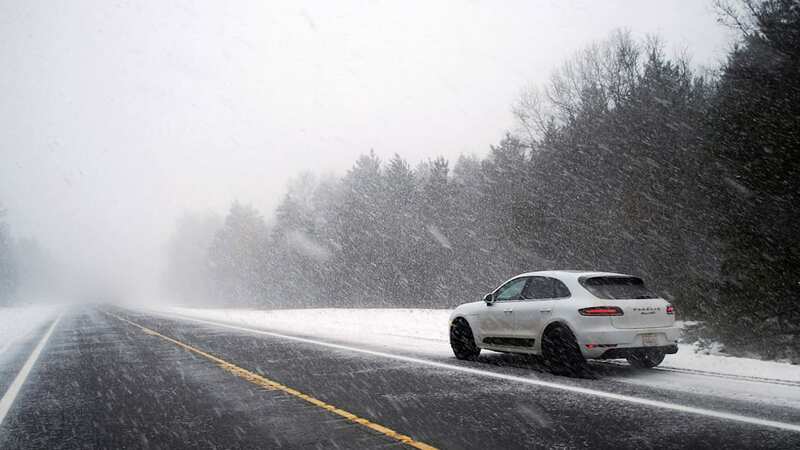 Visibility and light were both starting to fade, so we half slid half fell down the hill and returned to the Macan. With the automatic climate control on, seat heaters engaged, and exhaust set to loud we set off in search of friends and food. I'm not sure where the line between winter storm and blizzard occurs, but the whiteout was as bad as any fog I've ever seen. Lines of snow danced on the asphalt as the wind moved back and forth. The roads here had either been plowed or cleared by traffic, but they weren't going to stay that way. 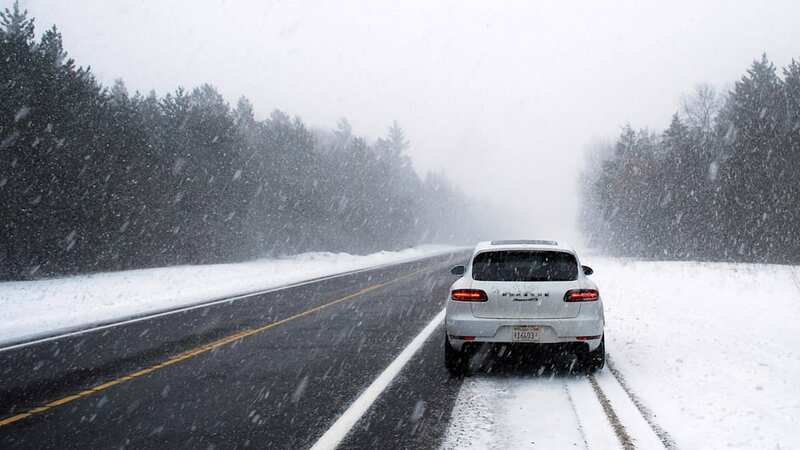 All the time, the Macan kept moving along, showing complete composure and providing no unnecessary drama. Occasionally there would be a few "rev, pop"s as I clicked off some upshifts just for a laugh, but aside from that intentionally induced fanfare, the Macan was calm, cool, and collected. We stopped for a few photo ops here and there. Snow-covered cars are still cool to me, and even the wife stepped out a few times to get a good view. 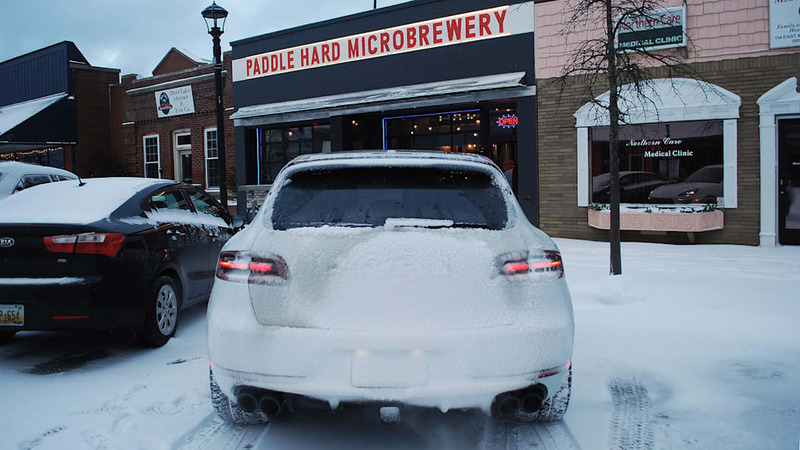 By the time we reached our stop, a local microbrewery, the car was covered with a light frosting that coated both the license plate and taillights. Ice was forming all around the car, hanging on the taillights with thick brown sheets in the wheelwell. It looked wonderful. I've heard people characterize the Macan GTS as a high-riding hot hatch. It's not and it never will be. It's big, it's heavy, and it can't always hide it. It is a supremely capable and well-rounded performance crossover. Why is that a bad thing? No one rags on the Subaru Forester XT for not being a WRX, so why should we hound the Macan for being something it isn't? 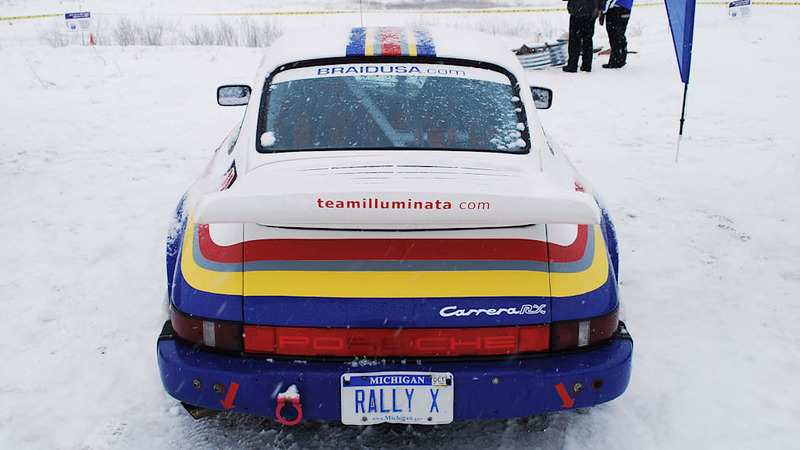 There wasn't a single moment during my weekend in the snow where I wanted to be behind the wheel of something else. 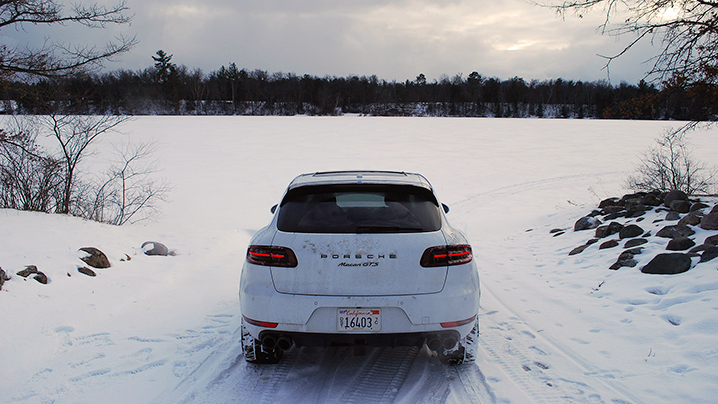 Deep snow, dirt roads, and a bit of ice did nothing to slow the Macan down. In fact, the feedback through the steering and the brakes gave me the confidence to push it, dipping into the throttle, popping off shifts, and letting the computer sort out the traction. I was quite sad to return the keys on Monday morning. If this is what Porsche calls a crossover, I can't wait to see what they can do with a proper sports coupe.